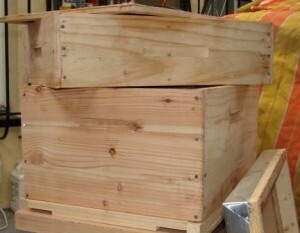 Treatment of Beehive Equipment – Beehives made of standard pine should be able to withstand many years of outdoor use. They must be protected from the elements. 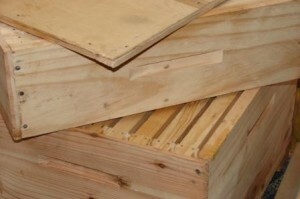 Generally there are four methods of protecting your beehive equipment. Paint two coats of Wood Primer and two coats of Acrylic Roof Paint. All coats must be dry before applying next coat. Only paint exterior of hive. Paint two coats of Wood Primer and two coats (Silver) Aluminium Paint. Apply as above. Soak full hive, exterior and interior, in heated Creosote and sun dry for up to three months. This method is known to preserve beehives for many, many years but some critics question the possible carcinogenic impact of creosote on foodstuffs. Bees however seem to have no problem living in fully treated dried creosote hives. Paint two coats of Waksol cold (no Primer). 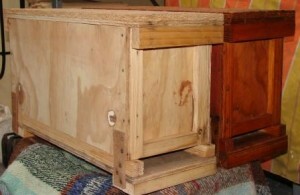 Allow first coat to sun dry for +/- two days and apply second coat. 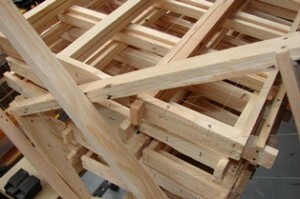 Waksol penetrates the timber but still allows the wood to breathe and has excellent waterproofing properties. Only treat exterior of hive and leave bee area natural wood. Bees have no problem with this product. Trap Hives – 5 Frame Wooden Trap or Nucleus Hives are mainly sold. These Catch Boxes are specifically designed for the African Bee swarming season and will last for years if properly maintained. Can also be used for Queen Rearing and nurturing weak or small secondary swarms.